Experience your digital music / video collection with related internet info, video streams, cover art, lyrics and more. All in a fast searchable database with a smart customizable interface. You can browse, list, search. edit, drag, drop, queue and play your videos and albums in track order. EJukebox automatically finds cover art for your songs and can import your CD collection. 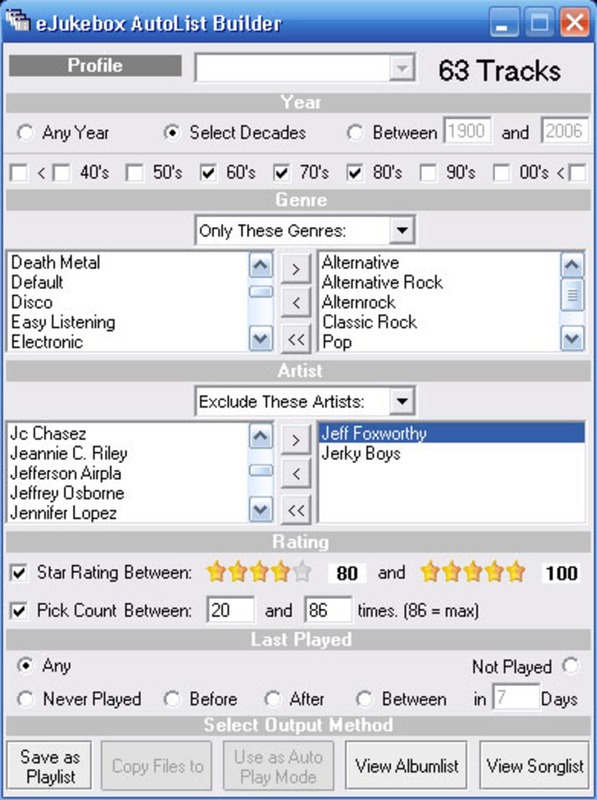 It keeps popularity stats on your music preferences and allows you to set criteria for what to play when the playlist is empty. It gives you full artist and album lists with art. It features an open file skin system that lets you customize everything from the button colors, css styles on the lists, to all the image files that make up the interface. Control EJukebox's playback and search your media database from any web browser. Query and Browse the web for related info using the integrated popup free browser. Lock the interface full screen and set options for public usage and so much more! 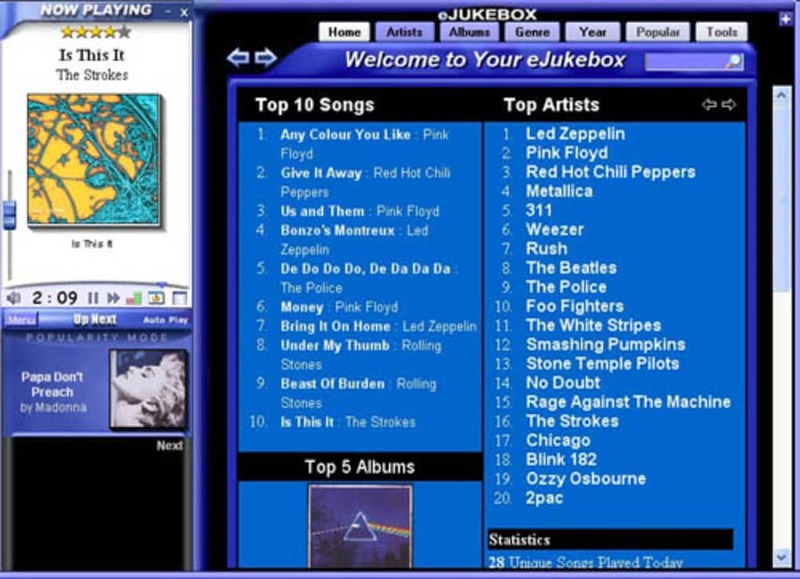 eJukebox features an interactive interface that allows you to graphically browse your music collection along with its album art. You can easily import music from your physical CD collection by using the built-in CD Ripper. 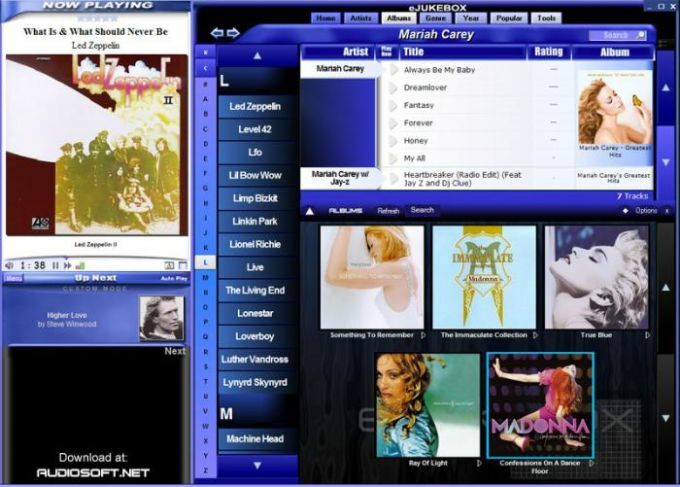 Behind the scenes, e-Jukebox utilizes the popular free program Winamp to provide support for the playback of numerous media file formats (MP3, OGG, WMA, APE, MPC and others) as well as hundreds of freely available real-time audio and visualization plugins. eJukebox offers more functionality than a physical Jukebox. It keeps track of how often each song is intentionally played so you can switch to Popularity Mode to have it automatically play your favorite songs when there are no songs in the playlist. You can also filter this playback more using the optional 5 star rating system. 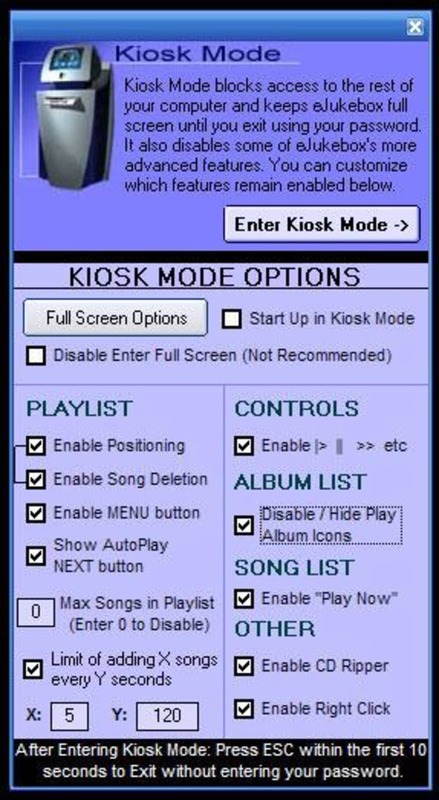 In addition you can have e-Jukebox autoplay songs from playlists files or bookmarks that you have created. Plus, e-Jukebox's Welcome Screen gives you a Billboard style listing of your Top 10 most popular / picked artists, songs, and albums. While browsing your music collection, eJukebox allows you to quickly view all songs by an artist / album grouped by their respective album cover image - by simply clicking any artist or album name that appears on screen. Plus the ability to view all of your albums from one interactive scrollable list. What do you think about eJukebox? Do you recommend it? Why?